How to Create a Mobile App Like - Instagram? Clicking pictures has become an essential part of our everyday life. Gone are days when people would wait to doll up for a special occasion to get their pictures clicked, as today photography has taken a huge leap from being a luxury to very much a necessity. In every way, the photography culture is a huge part of the modern society and people are greatly relishing into this cult. Best part is you don’t need to own a high-end professional digital camera to click beautiful and high-quality pictures, as today smartphones have majorly replaced these cameras with smartphone users reached 2.08 billion. With every smartphone having a camera, it has become possible for everyone to click pictures and share those via social networking apps. No wonder Mike Krieger and Kevin Systrom decided to take advantage of this back in the year 2010 by introducing Instagram. Since its launch, the service has been widely embraced by people around the globe and it is constantly gaining prominence, offering new features and reaching unimaginable heights. Currently, Instagram is an indisputable leader as it comes to picture sharing platform known all across the world. In fact, the official data provided by this service sounds really incredible. More than 80 million pictures are posted by Instagram users daily, while they like the pictures 3.5 billion times in a day, and this way monthly auditory reaches more than 400 million users. It is almost impossible to list all events that photo-sharing mobile apps can possibly be used on: self-advertising, travel and what not. What makes Instagram so popular among its users? What makes Instagram really unique and likeable photo-sharing app among its users is the fact that it never stopped evolving. This is one fact common with successful digital products. Besides multiple new features that were seen on Instagram over last few years, the platform also underwent an array of design changes that were both minor & major. No one can deny the significance of user experience to drive new users and to retain the existing ones. These days, UI/UX design is another component helpful in staying competitive by providing a good experience to the app users. Like, looking at apps like Instagram, you can see that their technically complex features are enfolded into this easy-to-use covering owing to their harmony with design. Thus, all features that the photography app like Instagram is packed with must also be enfolded into an appealing & aesthetic design so to better the UX. Now, if you are someone who is looking to create a mobile app like Instagram, then you must be prepared to not just invest in technical side of your product but also the design. However, design is certainly not the sole thing improved by Instagram over the years. As, there is an impressive technical feature list as well introduced to this app between the period of 2017 to 2018. Stories Highlights: This is a section where users import their ongoing & past stories, so they can be seen by the followers in regular basis. IGTV: This YouTube rival has gained prominence with the horizontal videos. Shoppable Posts: This feature allow the business accounts to mark their goods on the photos. Explore Page: This has been re-thought & re-designed. Meanwhile, this is just a sneak-peek of full-list of features that were introduced for this certain period of time. However, this does make it pretty clear that how important is the constant development if you are keen on creating a mobile app like Instagram, which is capable to compete with the other big players out there in market. Are you looking to create a photo-sharing mobile app? While getting a photo sharing mobile app developed, one must keep a certain factor in mind, which is your app must offer some unique features for it to stand out from the crowd and find place for itself in overcrowded app market. Simply focus on the uniqueness of your mobile app and the kind of opportunities it is bringing to the users. This will be your best bet to come up with something extraordinary and worthy. What are the features of Photo-sharing mobile app like Instagram? Authorization with email & social media accounts: You must enable your app users to signup/login into your app via various ways, consisting of mobile phone, email ID & social networking accounts like Google+ & Facebook. This way, users can login into the app as per their preference. Activity Log: You can divide this feature into two sections: Your activity and your follower’s activities. Here users can also receive suggestions over whom they can follow and keep track on their recent actions within the app. This feature will enable your app users to check the recent activities they performed on your app, like comments on pictures, following/unfollowing users, checking other users’ posts, and a lot more. The follower’s activity feature must show entire information about what the app followers are doing and also their exact time activity. Stories: As very much evident on Facebook, Whats app & Instagram, Stories has turned to be a majorly engaging way for content generation by the users. As a story gets published by a user, the app must send a push notification to fellow users. Thus, story feature can be best used as a mean to enhance user-engagement. You can further make the story feature unique by allowing the users a control over amount of time they want the story to be displayed. Like, by default the duration of story can be 24 hours, however you can allow the users to set their story display duration just as they desire. GPS Integration: Certainly your users enjoy travelling to places and often they want their social media followers to know where they have visited. Thus, GPS integration is a must for your photo-sharing mobile app.This feature is quite dynamic and allow users to automatically fetch the location or they may also choose to add the location manually when there is poor connectivity. Social Media Integration:So, your user posted a picture on your platform. Now they may also want to post this same picture on their other social media platforms as well. Thus, synchronising feature can be really helpful here, as it will allow the users to share the picture on other accounts as well. Not just this, but this is also a great mean to promote your app, after all every new platform requires promotion and nothing can be better than Facebook in this aspect. So, it is vital that if not others, you at least must provide a Facebook integration. This will enable your users to share their picture on your photo-sharing app and from their to other social media accounts with a single tap. This way not only you will build customer experience, but also promote your app by leveraging the user-generated content on prominent social networking platforms. Can there is a better win-win marketing gimmick? Cross-platform Compatibility: As is the case with Instagram, it is a dedicated photo-sharing app, which doesn’t run all its features on many desktops and operating systems. Thus, it would be greatly beneficial to develop a fully-functional web app and also a mobile app. This way, your smartphone camera will be important, but you can also code the app in a manner that it will be able to access webcam as well to click a photograph. Meanwhile, it can be used for purposes other than posting & sharing pictures, as you can create this kind of app to help user in performing all actions using a web app, such as like an image, comment on that, or even share it with a group, etc. Direct Messaging within Stories: This is one exciting feature that users just love. It is very much like speaking to public but you get personal replies. Here, the app user can ask his/her followers a question, or may ask their suggestions, create polls and continue the engagement within the platform via short video, image or plain text. Filters for Picture Editing: This feature will enable your app users to edit pictures using various filters & editing tools such as rotate, colour combination, straighten, crop as well as perspective correction. This way users can apply filters and upload pictures/videos on the app. User Profile: Your users will be able to maintain their entire profile, like detailed description, such as name & email, following, followers and entire number of uploaded pictures/videos, & tagged pictures. Search: This feature will enable your users to search for another app user, may include friends, family, relatives or anyone, simply using their username or name. In order to initiate a search, users simply need click on search feature and enter the user name of the user’s name. Upload Pictures/Videos: Here the users will be able to upload photos & videos directly from library or by using their smartphone’s camera. Following these few simple steps will enable your users to upload many photos & videos. Push Notification: This feature will allow your users to get real-time notifications everyone someone has liked or commented on their photos/videos, sends an add request, mentions them in a comment, or maybe an activity that is related to them. Analyse Client’s Requirements: When you have successfully discovered a photo-sharing mobile app development company, and begin with the development process, you will first be contacted by a sales representative who will try to understand your expectations and requirements with the project and analyse your end-goal, all depending all the kind of photo-sharing mobile app you are keen to get developed. Wireframing: Next, step is preparing wire-frames of your mobile app. Here, the business analyst will create a wire frame of each screen of the photo sharing app, will show you all screens, features & functionalities. Designing: The UX designer in the app development team is assigned the task to take care of interaction between the design elements whole UI designers is the one responsible to design look & touch of the app through graphics, perfect colour combination & iconography. Development: It is this stage when the app development team will begin with the creation of Instagram clone app with the necessary features and specifications. Testing: This is the time when the app will be tested. Meanwhile, the main aim behind testing is ensuring that your Instagram-like mobile app is bug-free and properly works on the devices. For the final app approval, the stakeholders are involved too. Deployment: This is the time when the photo & video sharing app will be finally deployed to your server & then released on the app stores so that users can install them and start using. Which are the monetization models involve to create an app like Instagram? Well, in case of Instagram, it makes money by monetization on the attention span of the user. The more is the attention span, the higher will be the revenue. So everything regarding app development has been almost covered, so now you must be wondering about the cost involved in creation of such an app. Let’s find out next. What is the cost to create a photo-sharing mobile app like Instagram? Features: Here, you have a choice to go with three possibilities that can be used to create such an app. Like, you may either go with most viable features, advanced features, or maybe a perfect blend of both basic & advanced features. 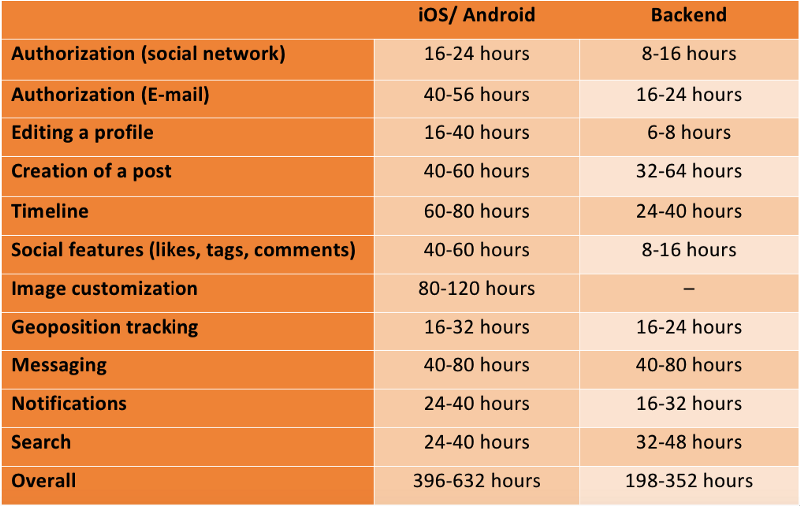 Operating System: Now developing an iOS app will certainly be expensive in comparison to Android app. However, ultimately it depends on your target audience and their choice of device to choose the operating system. There is a chance that your target audience will be having an equal ratio and you may need to launch a mobile app for both platforms. Technology: If you code your app in Kotlin, it will be costlier, however trendy. So, decide as per your mobile app development requirements. Same way, you need to make a smarter choice with native & hybrid app development. In case you’re not technically sound, you may choose to seek assistance from the app developers. Resources: If you are not having a team of hard-core developers and planning on outsourcing them, then you require to be really careful while doing the selection. You may choose to look for case studies & their experience. Next, compare the app development cost and then decide. Now different development firms may have different variables, hence there will be an ambiguity over the cost of making Instagram like app. So, the exact figure is difficult to determine but one can have a rough idea. Like, when considered the most basic app version with just MVP feature and clean UX/UI design, the expected price for the development will certainly go up to $6,500. However, here the little support & maintenance will be needed. When considered a combination of basic features with some of the advanced features, then the price will rise somewhere between $20000-$25000. Next, when considered the app to be created with complete advanced features, then the cost mat go up to $65000-$75000. Conclusion: With this era belonging to social networking apps, it can be really profitable to have a social media platform like Instagram. This will be greatly advantageous for your business. After all, people today just lobe using social media platforms and if you succeed in providing them with extra features and benefits, you will have all chances to lead the race. Now, it’s time that you get in touch with a good photo-sharing mobile app development company and get started to reap the best benefits.